Note: I have now added a section entitled – One year later after using this product – to give an update of my experience with the items in question. If I say I am going to do something I do it and I very rarely do it by halves, well sometimes I do but then I add the other half at a later date. 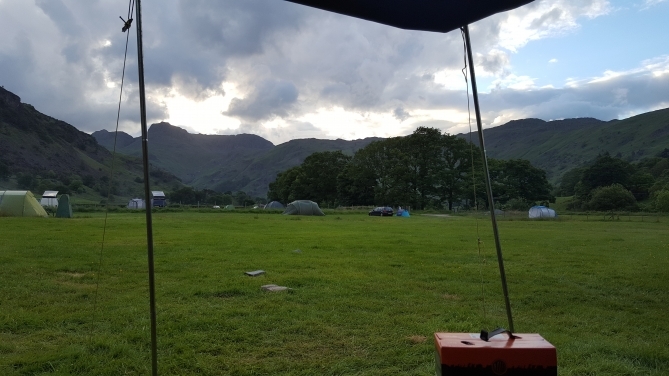 In a previous blog you may remember me ranting on about camp-sites losing some of the back to basics vibes I used to get when I went with my mates years ago. Campsites are now so well equipped, well used and well regulated that having a laugh beyond 10pm is now a crime. That is of course not to say that I don’t enjoy the campsites, I do love them but in order to love them I have to find pleasure within the rules. This often means going to the pub instead of hanging around the camp-site and treating my tent or campervan as just a place to sleep. Last year I discovered something new that I never really knew about before as I am not really aware of anything unless it slaps me in the face. I was looking for a local recommended camp-site on a popular VW forum and found a recommendation for Brockwell Woods, which is just a privately owned woods that you can drive in to and camp using either a tent or camper or tarp if you like. Best of all it was just up the road from me but it could have been 200 miles away when I actually drove into the woods. I had an amazing nights camp, cooking food, lighting a fire (which is allowed) and having a drink with Julie with BFBS Radio on in the background. It was a bit like wild camping light but it gave me the taste for it. Leading on from that experience, I decided to check YouTube just to see if anybody had made a VT of their trip to Brockwell, mainly so I could relive the moment. I came across a guy called Andy Wardle, who had made a VT but better than that goes proper Wild Camping most weekends, and that was me hooked. After watching pretty much all of his uploads I decided myself and Julie should get the Wild Camping Kit and give it a go. Here is Andy’s youtube channel but also another favorite of mine is the Fell Wonderer, who uses very basic kit compared to Andy but seems a really canny bloke and easy to watch. 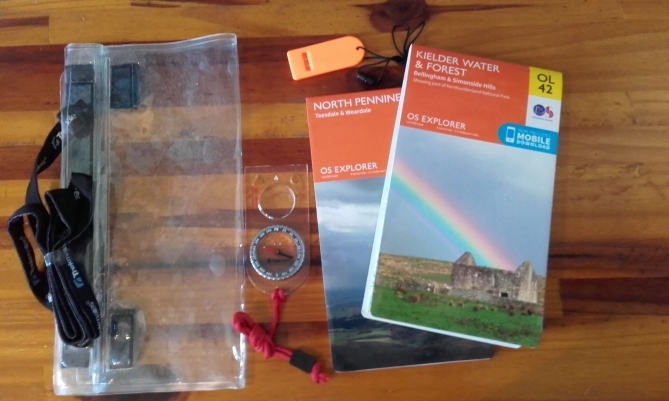 So anyway to get to the whole point of this blog, I want to show you what kit I have bought so if you too are deciding to try wild camping, this blog can be used to help you think about what you may want to take. At the point of writing I have never been proper wild camping and all of the kit is pretty much unused. 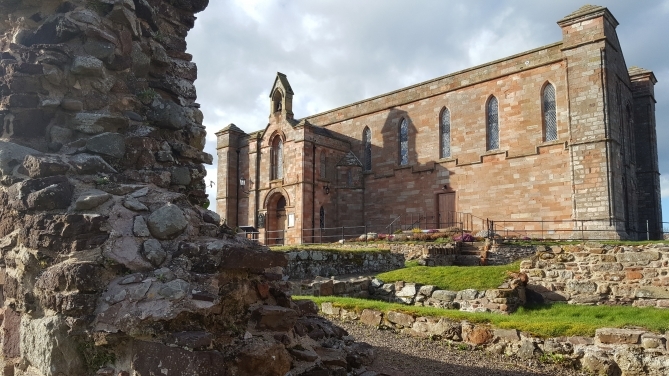 As I am going wild camping with my Fiance, my purchasing decisions have been more aimed to comfort and facilities and then weight / pack site as a next priority. If you too are going with your partner this blog will be of more use than a solo traveler. This is just looking at the kit, I have also had to buy clothing but won’t go into that here neither will I talk about food and snacks. 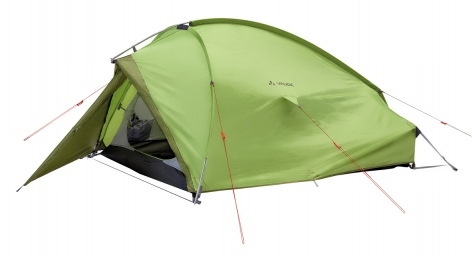 About the product: The VAUDE Taurus 3P is a 3-season introductory tent to the world of hiking and camping. Well ventilated and a easy to pitch. The durable outer tent is made from weather-proof PU coated polyester that can stand up in a downpour, while keeping you well aired inside with ridge ventilation. The additional pin solution creates more foot room and increases the tent’s wind stability. It retails at £240 but is now classed as a discontinued product. It is however still very much available on-line. As it’s an old line I picked up a brand new one for just over £100 but it came from Spain so took a few weeks to get here. Looking on-line it appears to have gone back up a bit in price, I may have got it cheaper as I bought the tent at the end of the 3 Season camping period. I needed a tent for both myself and my partner, this tent is very light when you balance that out with just how much space you get, its much bigger than I was expecting when erected but a sensible pack size for 2 wild campers. I read some really good reviews about how well it stands up in bad weather conditions. 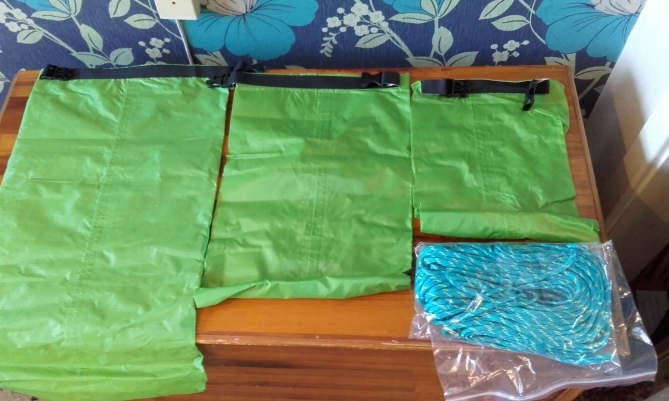 One year later after using this product – This is a great starter tent for the money, only issue is a bit of water getting in but I am going to seal the seams which I think will solve the problem. Many better tents exist but they are expensive, if I do upgrade I will buy a Hilleberg 4 season tent as this is what most wild campers I watch on YouTube recommend. About the Mat: Thermarest Neoair Venture WV Mat (Regular) – Soft and lightweight with minimal packing volume and more than twice as hot as an air mattress. Patented Wave Core construction locks the air and makes Venture suitable for spring, summer and autumn. You are stable and comfortable for a good night’s sleep. Heavy outer ensures longevity. The mattress can be blown up by mouth, pump sack or air pump. Although new to this, Thermarest have a good reputation when it comes to mats, so I concentrated on this manufacturer. At first I fancied the self –inflating version of the Neoair but in the end I opted for a blow up version as it was nearly half the price at just £50 on ebay. One of my main aims is to ensure Julie is warm, so she keeps wanting to go camping and this mat appears to meet that criteria. I have tried it in the house and can say on the plus sides it is very comfortable and warm in that context and long enough for tall people. On the negative side I go dizzy blowing up 2 of these mats, it only takes about 25 blows each but not sure that will be good after a hike. Also it is fairly narrow but as it packs down so well you have to compromise at this price range. It is available in large which has the dimensions 63 x 196 cm as opposed to my regular which is 51 x 183 cm but it is more expensive and heavier. After I bought this mat a work colleague said you can’t go wrong with the Mats from Alpkit as he has had his for years and loves it. 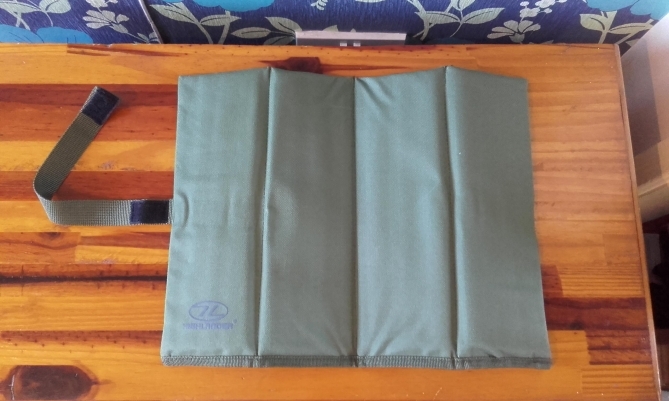 Here is the ebay link for the Thermarest. Here is a link to Alpkits Mats. About the Pillow: It’s just a basic pillow from Go Outdoors, cost me £5! Might upgrade in the future. One year later after using this product – The mat is fantastic, lovely a comfy, not a lot of cold coming up from the ground and compact / light. Had no issues with this Mat. The pillow on the other hand is rubbish and lasted 2 trips. I woke up with a small thing in my ear, turned out to be the pillow! Don’t waste your money, much better to get an inflatable one. I got a cheap inflatable pillow from Go Outdoors, the cheapest they had. 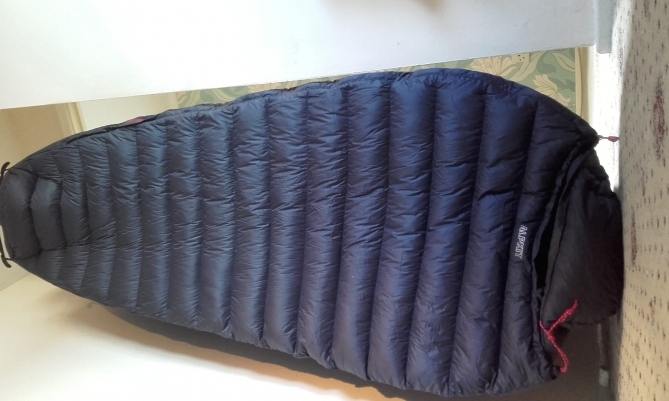 It is biggish and heavier than I would like but the comfort is well worth the bulk for me. 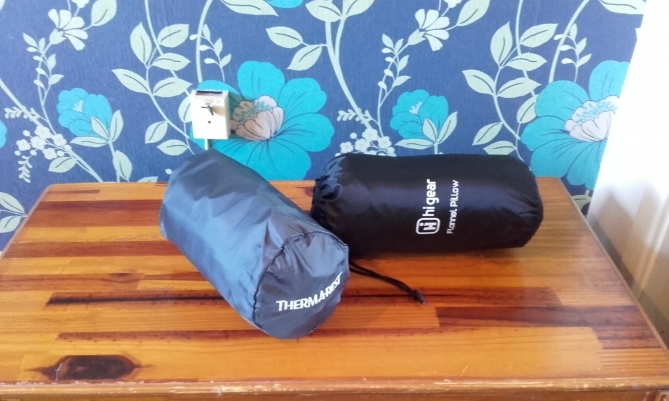 About the product: ‘This years Alpkit PipeDream 400 has been pared down to the bare minimum to give a lightweight fine tuned sleeping bag with the adventurous traveller in mind. Optimised with 750 fill power down to get the most warmth, yet only 755 g, with no unnecessary features. This specialist bag uses 400 g of 90/10 goosedown and is suited to 2-3 season use or as a liner bag for winter trips. The bag has a DWR coating so the odd drip of condensation or early morning dew won’t ruin your bag’s insulation and the black colour scheme absorbs heat from the sun – so if your down is unlucky enough to get wet, it will dry quicker. 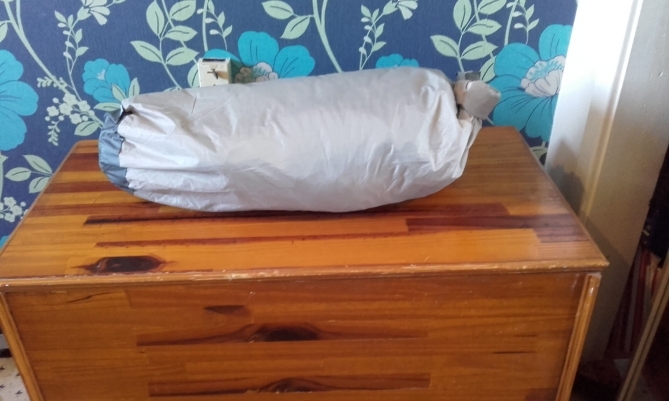 I researched sleeping bags for ages, I started with a £100 budget and kept looking at more and more expensive bags, thinking along the lines of a Mountain Equipment or a Rab down bag. I kept bidding on them on ebay but was always out-bid and they go for massive money. Always in the background of my research was the Alpkit pipedream 400 and in the end I went for this as it does everything I needed at a very good price. The bag cost me £150 direct from the Alpkit web-site, which incidentally is the only place I think you can get Alpkit products. They sell directly to the public and not through re-sellers such as go outdoors. When the bag arrived in a box from the courier I honestly thought it was empty as this bag weighed so little. The weird thing is when you take the bag out of its stuff sack, shake it a bit, it fills with air and grows into a big cosy sleeping bag. It reminds me of those egg things you got years ago, that when put in water expanded to a full size tea towel. 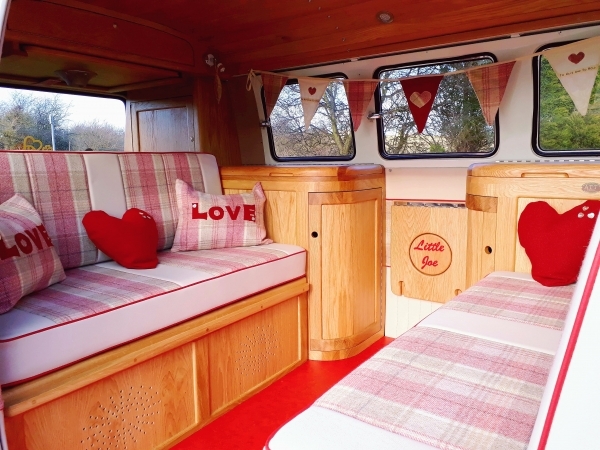 It is very roomy so you can move about easily which is another good point as I am a shuffler. I am also a warm sleeper so this will be ideal for me as a 3 season bag. 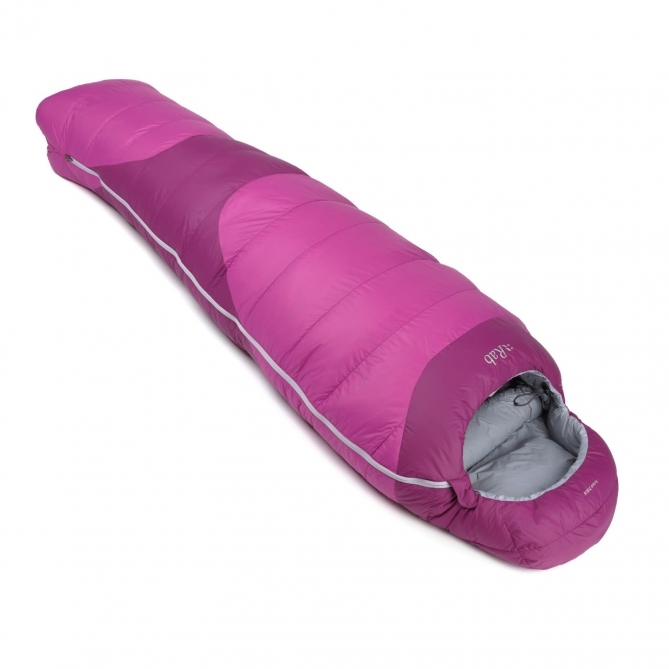 Julie however is not a warm sleeper, after plenty of research she is opting for a heavier but great quality RAB Womens Ascent 700 Sleeping Bag. 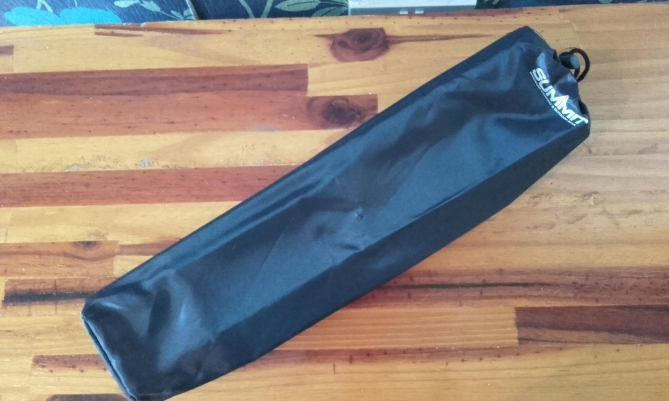 We have chosen down bags as they are generally warmer than other types of bag compared to the weight, although the advice seems to be to keep them dry to protect the thermal properties of the bag. Here is a link to the Rab sleeping bag on Cotswold outdoor, we will probably get it from that shop as they price match from the web. 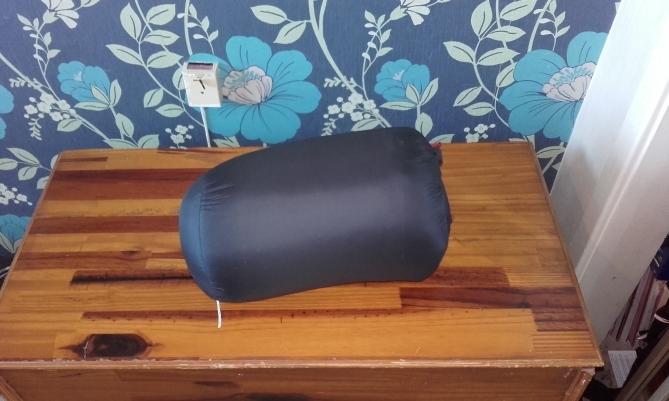 Here is a link to my sleeping bag from Alpkit. One year later after using this product – The Alpkit bag does exactly what it is supposed to do, a perfect and compact 3 season bag. It really takes up hardly any space and is much more compact than the RAB bag. 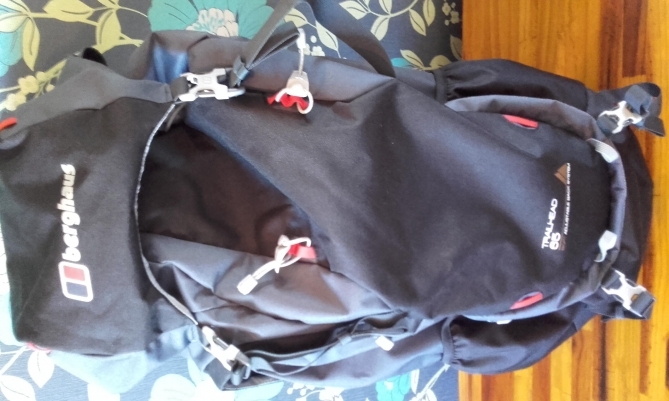 The RAB bag is however a real bit of quality kit and could be used 4 season in the UK. I can say without question this is the best bit of Kit we have. I would in the future if I start doing 4-season camping upgrade to a RAB Bag for the winter. This was the first thing I bought and it was only £19.99 from Go Outdoors. Andy Wardle uses the same one and said he had no problems with it. 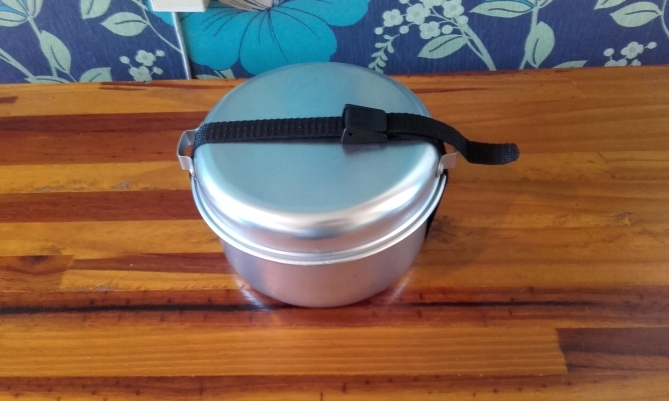 I have used it a couple of times and its really spot on, nice and powerful, folds up really small and I really like that the gas bottle attaches at the side of the burner and not directly on to it, which is probably more stable. Since buying this I have noticed you can get more fancy stoves but I watched a review on one of the top end models and it looked a mess on to me i.e. priming them first and then draining the fuel after use. This will do the job for what I want! 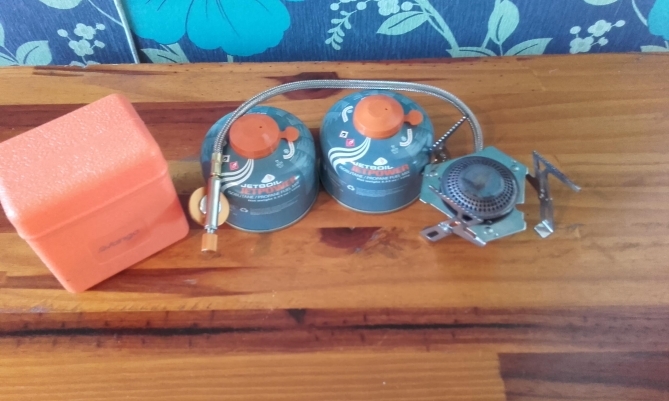 One year later after using this product – Fantastic little stove, will probably use this forever as cant say I have been tempted by any other and don’t think you need anything else. I may buy a different type of stove just for a new experience e.g. wood gas stove. 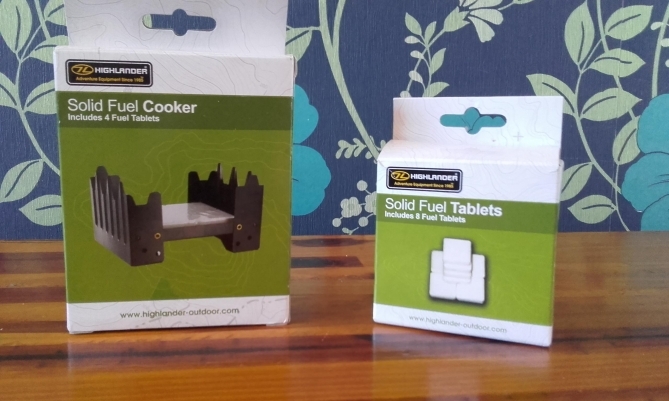 A compact cook set, ideal for 2-person camping, walking and backpacking trips. Just the second thing I bought from Go Outdoors and really light and really cheap at just £7.99. Used to make some soup and boil some water so far and were spot on. Not sure yet if anything else may stick as they are not non-stick but so far so good. One year later after using this product – They do the job but a bit fiddly to strap them back up and also poor quality. On the plus side very light and good size pots for 2 people. Maybe upgraded soon. For tea and coffee I bought 2 cups with thermal properties, but just cheap ones from Go Outdoors. A tiny salt and pepper shaker with 2 compartments in 1 unit and tiny little cloth. Also a cheap stove wind protector I got on ebay. 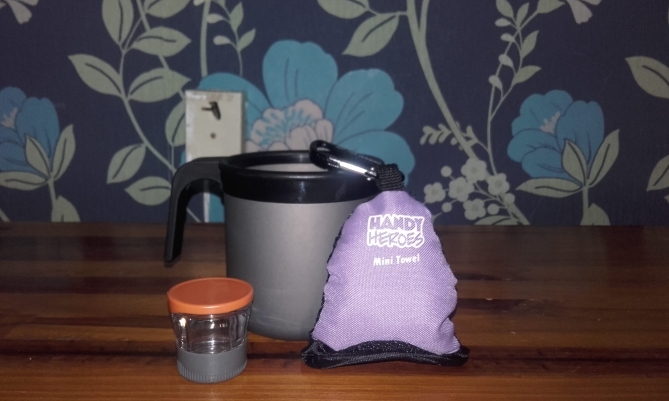 One year later after using this product – The handy towel is handy, the salt shaker is perfect but the cup is just alright. Not that nice to drink out of and gets really hot on the cup part. This is just a basic solid fuel stove I bought from ebay for a few pounds. It is basically a metal box that holds 4 fuel tablets. You open the box, light 1 or 2 tablets and place your stove on top. I think they use them in the army. Might never use but a light way to take a back up stove. One year later after using this product – Never used this and carried it miles, probably could leave this at home. 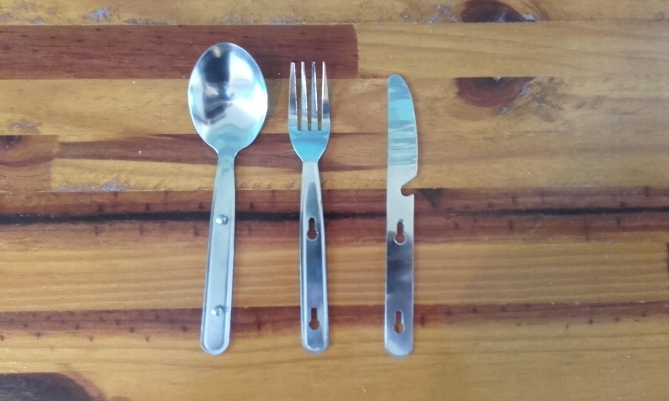 One year later after using this product – This set of cutlery is great, I think better than a spork and nice to have an almost full size set to eat with. I will have to check the rules on carrying a fixed blade knife like the one pictured. I bought this from Cotswold outdoor for about £30. I will probably only use this when I go to Brockwell Woods as you can have a fire on site. 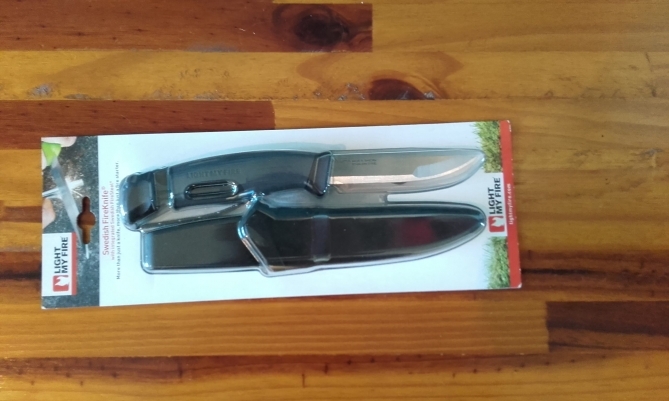 This knife has a built in fire steel and we can use the knife for food preparation. 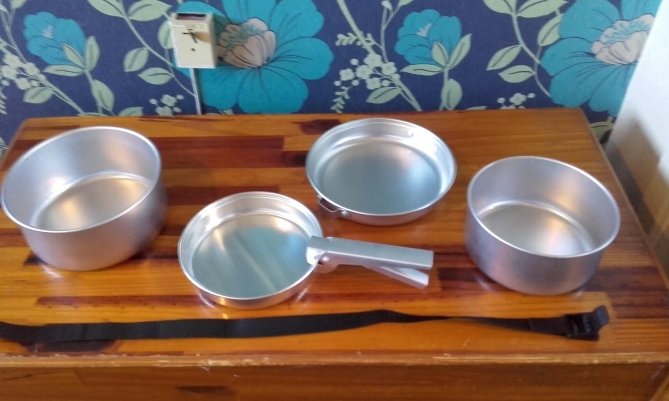 One year later after using this product – This does the job, lighting fires, food preparation etc its not so bulky and has been a good product. I could probably do with a small saw for cutting up wood as well. Might get one for Christmas! The Swiss army knife has migrated from my camping cupboard to my wild camping box as it’s never yet been used when camping. 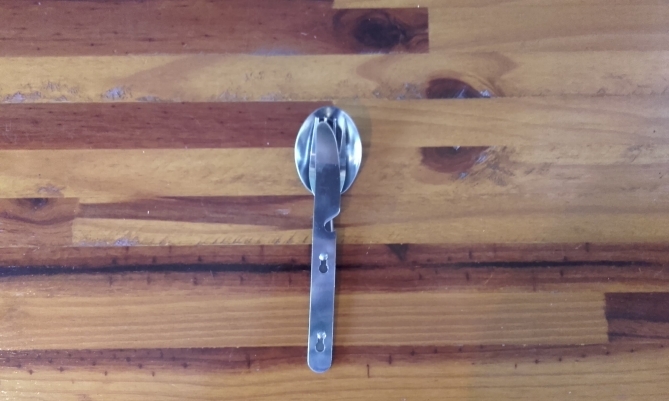 I am hoping to find a problem that can be solved using these tiny tools other than opening a beer. I would love to meet the actual Swiss army, with their tiny little weapons……mad! 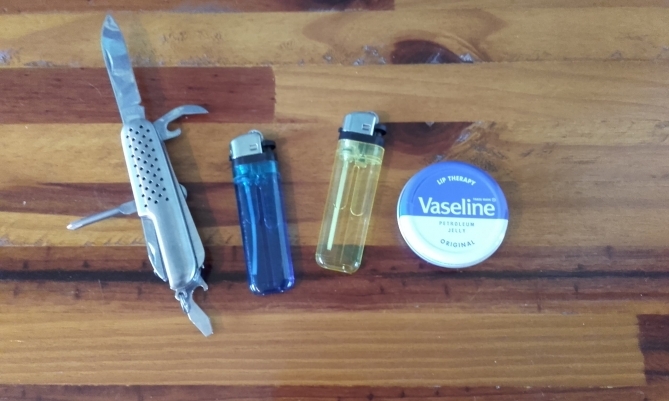 The lighters are for my stove or a fire where allowed and if you add Vaseline to cotton wool balls they take a spark really well and burn for long enough to get a fire going. One year later after using this product – Don’t use the pen knife much but still worth taking I think. With regards to the Vaseline I now take a full size pot as its actually cheaper than the little ones. It is more bulky but saves me having to think about replacing it all the time. The wee table as I now refer to this, taking the saying from one of the wild camping uploads on youtube. Not a bad buy at just £6.99 from ebay it does the job. It is nice and light but fairly large pack size, also I couldn’t work out how it folded down for so long that bloke from the crystal maze locked me in the room. One year later after using this product – Its still going but on its way out. Cheap but you get what you pay for and not sure what else is out there that’s better. ‘Prism 550 is a monster of a headtorch- but a friendly, agile sort of monster. With 550 lumens of superpowers, Prism 550 will be guaranteed to illuminate everything within its 135 m range. The aluminium construction gives Prism 550 tremendous durability and is rated to IPX7 waterproofing, so it will endure accidental submersion. The top headstrap and soft rubber head plate will keep Prism 550 securely in place. This combination makes Prism 550 great for trail runners, kayakers, mountaineers and climbers. Prism 550 has a projection angle with free 180° movement and a burn time of up to 60 hours. Weighing only 153 g, Prism 550 is a comfortable 77 mm in length- meaning that it will fit neatly in your coat pocket, ready for use. 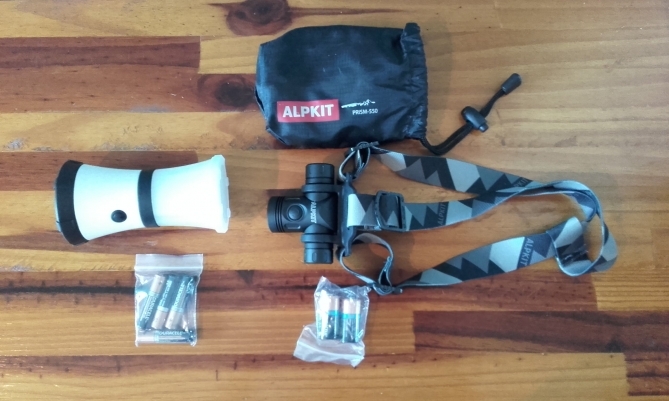 I have been impressed by my Alpkit purchases and the cutomer service / delivery times that’s the main reason I bought the head torches. I wasn’t really sure how many lumens was enough so this was ideal as it has adjustable modes. I actually went for a hike and got lost in the pitch black last month. I took the headtorch to be on the safe side. I put this on the highest setting and knew I would be ok, it was so bright I could see into the future. Not sure I like 1 element though, it takes expensive 3v batteries so I will just use on a low setting or It will be an expensive addition. One year later after using this product – I am not a fan, I would say I made a mistake buying this head torch. On paper it sounds great but it has many draw backs. 1 – the batteries are a weird type and cost a fortune, 2 – although it is super bright if you use that setting they drain the batteries and so I always keep it on a low output and 3 – It is heavy and unbalanced and gets right on my wick. Wont be replacing it for a while as you do get used to it but not recommended unless you work down a pit and have shares in a company that makes batteries. Why would you not buy a Bob for wild camping, probably my favorite purchase. Well-made, water-proof and perfect for the job in hand. If you want a light for wild camping this is it in my opinion. Love that it is called Bob as well, why not give your camping products human names! One year later after using this product – I love Bob, best light I have and take it normal camping as well. Great product! 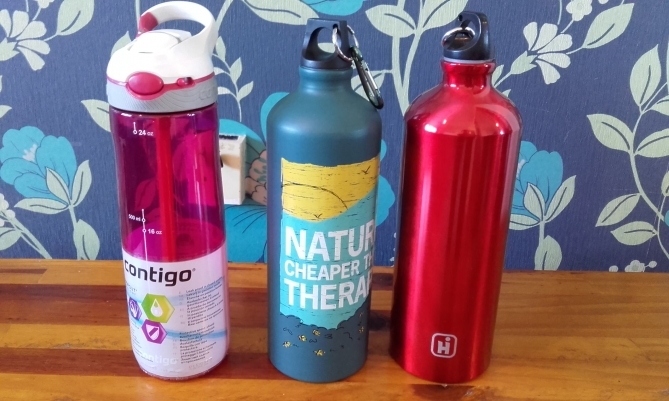 This is just a small selection of the water bottles I have acquired since starting this project, I can’t stop buying them, it’s like women and candles! I don’t actually know how much water I will need yet, so my plan is to take 3 litres each for 1 night stay. This should give us water for tea / coffee and cooking as well as drinking water but don’t take my word for it, I have not been wild camping yet. I bought my rucksack after the bottles and noticed it takes a water bladder with a drinking straw. I might get a one of these in the future, if I think it’s worthwhile. One year later after using this product – Happy with the bottle system, we take 4 bottles between us for 1 night and this is o.k. but I take my water filter just in case. On a longer walk might need extra water. I think water is the heaviest thing you take so this may not be the best system. Possibly a water bladder would be better or actually using my water filter and taking just a small quantity of water. Hopefully I won’t need the first aid kit but better to be safe than sorry. 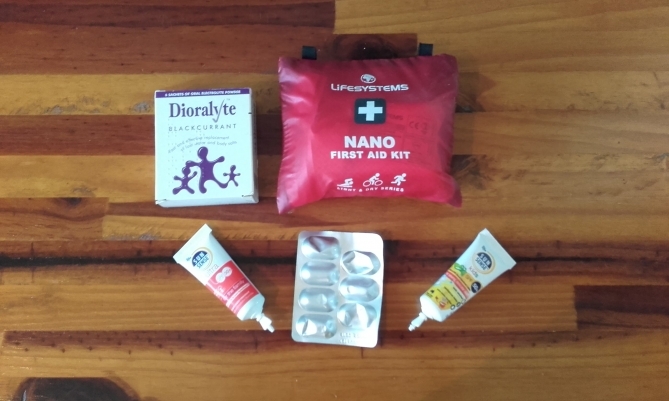 The first aid kit cost me about £13 from Cotswold outdoor, which is expensive but hopefully will last forever! The dioralyte is an addition I made as a precaution if we lose salts when walking. It has helped me and my mate out before on a week-long bike ride, so it’s something I like to have with me for things like this. No doubt I will be having a little drink on our trips, which gives me heartburn. As I can’t take a litre of milk with me I pinched some of my Dads omeprazole. One year later after using this product – Not had to use this apart from the omeprazole that I added to the pack. Nice small and light product so would recommend on that basis. Julie said we need these!! I am sure the whistle will come in handy if I get lost at a rave!! Just to clarify when I got lost on Simonside last month it was just because it was really dark. One year later after using this product – Don’t massively use them but need to take the correct map just to be safe. You can’t rely on your phone as hardly ever have a signal in random places. This is just a basic sit mat to me keep off the ground, again just a few pounds on ebay. 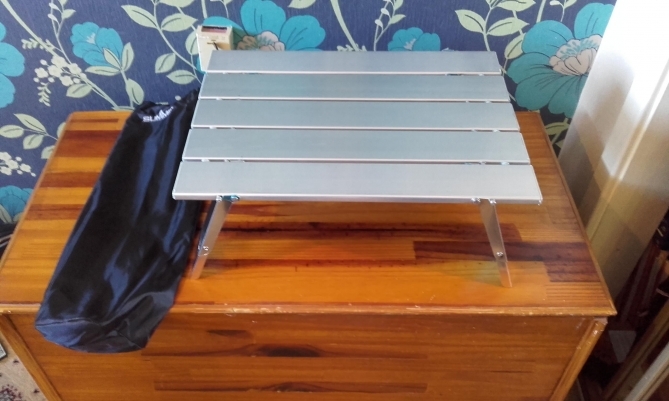 One year later after using this product – The sit mat has its place as a light weight solution to a problem. For me I wanted more comfort and invested in the best camping chair I have ever owned. It is lovely to relax in with a beer and relatively light weight. If you google – Alite monarch chair – for more info. I have been advised to keep as much as possible in the dry bags and then inside the rucksack or you can have a miserable wild camping experience. These are again just basic cheap ones from ebay in 3 different sizes. You can pay more and get branded ones, but if these do the job why spend extra. One year later after using this product – I say above why pay extra, just shows what I knew back then! Pay extra because these are poor, they ripped on day 1 and have been replaced. Covering both FM and DAB, this personal digital radio has a full screen with scrolling text display or you can get sports scores by text operated by some DAB services. 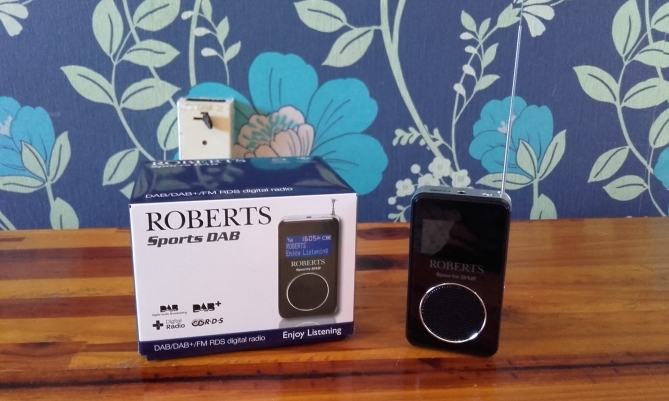 Not only is this black and silver Roberts Sports Portable DAB Radio perfect for sports fans but it’s also great for anyone who wants to listen to DAB radio stations on the move, or stay up to date with news while out and about. Lightweight at only 157g, including built-in battery (not including earphones and AC Adaptor), pocket this Roberts Sports Portable DAB Radio and stay in the know! One of my favourite things about camping is listening to BFBS Radio, such a good mix of music, the presenters are really easy to listen too and best of all no adverts (or very few). So I was looking for a lightweight DAB radio with built in speaker and this fitted the bill perfectly. 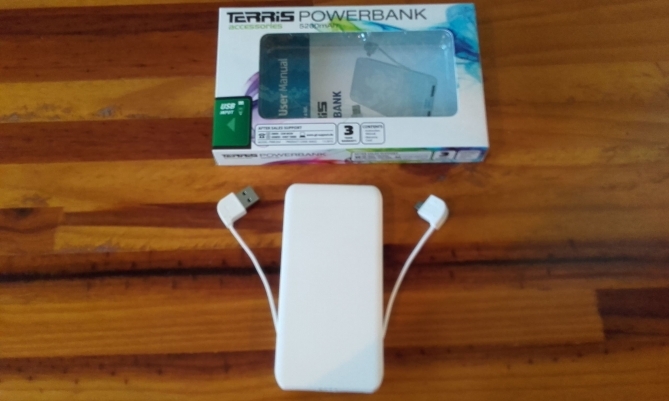 I use it all the time and it has a good speaker for its size, the battery lasts ages it is very easy to use and well made. Remember Roberts products have 3 royal warrants so good enough for royalty is good enough for me. The radio can be bought for around £65 but its well worth it. I can highly recommend this DAB Radio. One year later after using this product – One of my best buys but cant always get a signal depends where you are. Lightweight, excellent quality and used many times. I picked this up in ALDI for about £8 or £9 and it is a back-up charger / power source for your phone or tablet. Obviously useful for safety purposes to ensure your phone is charged but also good if you want to use your phone or tablet to listen to some music or watch something as this will power the device for much longer. All it is really is a second bigger battery, you charge it before you leave and use the power as required. One year later after using this product – This does the job and does get used, well worth having but maybe could have bought a lighter version. This does however hold a lot of charge. Last of all I bought for myself the Berghaus Trailhead 65 rucksack and Julie bought a purple Berghaus Trailhead 60 woman’s rucksack. I am personally a massive fan of Berghaus and through-out this venture have tried out and looked at other brands, great brands that I now love but I still come back to Berghaus for quality and comfort. Hence why I bought this back as it was the most comfortable fit when trying them out. Both myself and Julie managed to get our bags for around £65 which is a bargain for this much quality. I bought my bag at Cotswold outdoor in Newcastle and they price matched for me as it was on sale for £90 which is the RRP. Julie got her bag online as it had just appeared for sale with a camping store. Here is a link to a review on the bag, I am happy with mine! One year later after using this product – Love my Rucksack, tried many before getting this and it has not let me down. Perfect size, well made and very comfortable. 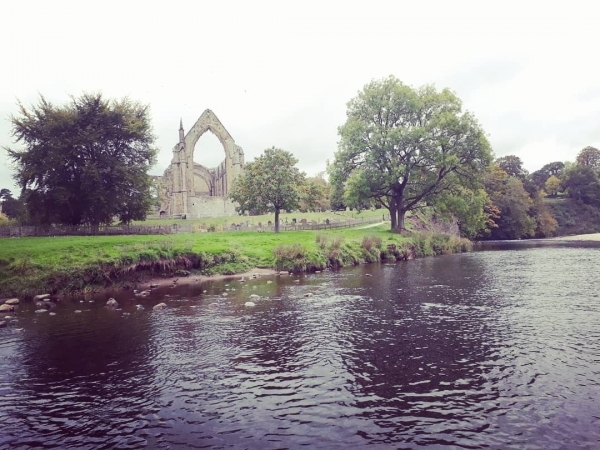 Sorry this has been such a long blog, I didn’t realise how much I had accumulated over the months of putting this wild camping stuff together. On a final note, I have found a happy medium for those who basically want to go back to more basic camping but don’t want to go out-out wild camping. Here is my newly discovered link and no doubt I will give some of these a try in the future. 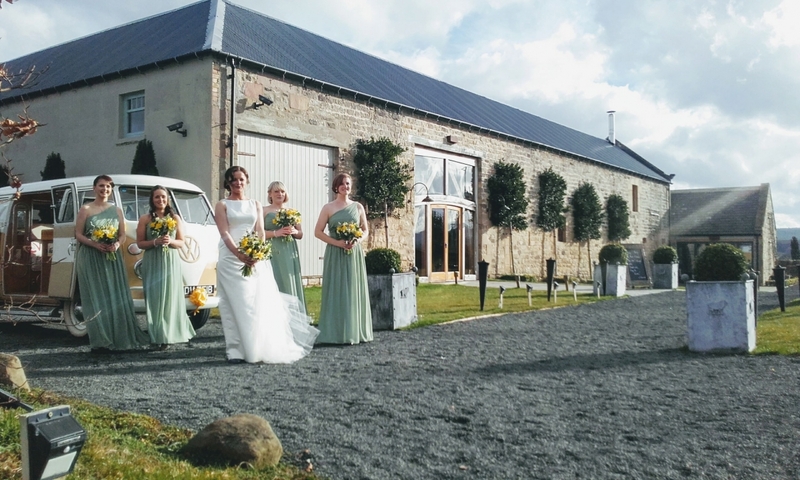 "We just wanted to say thank you once again for doing our wedding at the weekend it was a fabulous service that you provided......there has been loads of positive comments..."
"Thank you so much for the awesome service that we had! Everything went smoothly, and we're still reeling off the happiness of the wedding day! Little Joe was so perfect, ..."